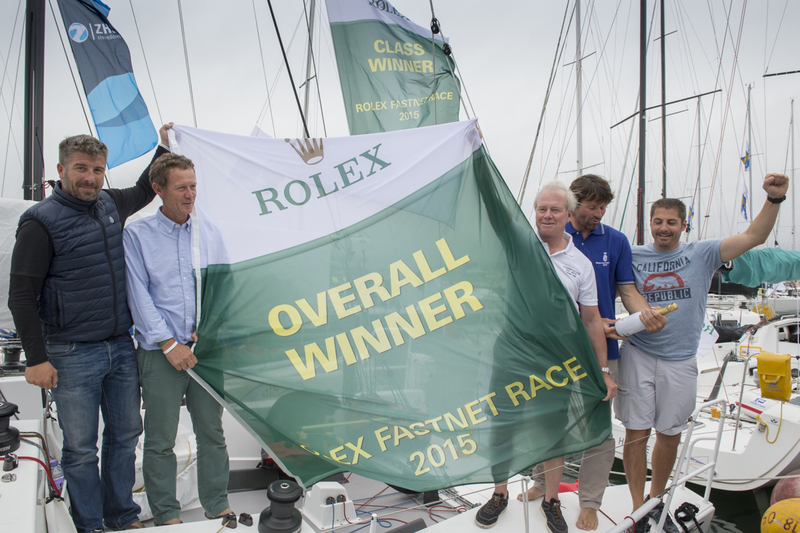 The Rolex Fastnet Race, the event that caused the formation of the Royal Ocean Racing Club, celebrated its 90th birthday in 2015. How the founding fathers of the club and its flagship event would have been in awe of their creation with 300 boats signing up within just 24 minutes of the entry list opening in January, a record-sized fleet of 356 boats starting from the Royal Yacht Squadron line making the Rolex Fastnet Race by far the largest of the world’s classic 600 mile offshore races, in terms of participation. It attracts top teams from around the world with boats ranging from Spindrift 2 and Comanche - the world’s fastest offshore racing multihull and monohull respectively - down to Contessa and Dehler 32 cruiser racers with every conceivable flavour of offshore racing yacht in between. The upper echelons in the fleet are packed with America’s Cup and Volvo Ocean Race winners plus Olympic and World champions, while the bulk of entries are Corinthian with sailing school and family crews for whom the biennial race from Cowes to Plymouth via the Fastnet Rock off southwest Ireland represents the pinnacle of their sailing season, if not their careers. From some way out, the forecast for this year’s race was extremely light. In the event, the nine fastest boats made it around in reasonable order before high pressure over the Celtic Sea saw the wind disappear from the race track for 36 hours. This caused multiple park-ups, huge compression in the fleet and several attempts at deep water kedging. These conditions affected all but the smallest in the giant fleet, and continued until Wednesday when the more usual frontal systems resumed rolling through, providing a fast finish especially for the mid-fleet. True to the forecast, among the multiple starts, that occurred at intervals from 1200-1340 BST on Sunday 16th August, those leaving earliest, including the nimble multihulls, struggled to cross the start line against the last of the flood tide. And when the tide did turn favourable, it proved disastrous for boats that were over early, taking them more than half an hour to turn around and claw their way back to the line to restart successfully. While, thanks to the ultra-light forecast, pre-start expectations had the Rolex Fastnet Race tailenders arriving sometime in week two, in fact on the morning of day seven of the Royal Ocean Racing Club’s 90th anniversary event, just five boats remain at sea. Bringing up the rear, Martin Lossie’s Dehler 32 Picolini was expected to reach Plymouth late this afternoon. Winner in the Rolex Fastnet Race’s smallest class, IRC 4 was inevitably French, but on this occasion French boats managed to secure only 50% of the top 10 places in this 37 boat class. For Gerard Quenot and crew, this was the second occasion he had campaigned his JPK 10.10 Alkaid III – Nautistock.com in the Rolex Fastnet Race, finishing fourth in class in 2013. 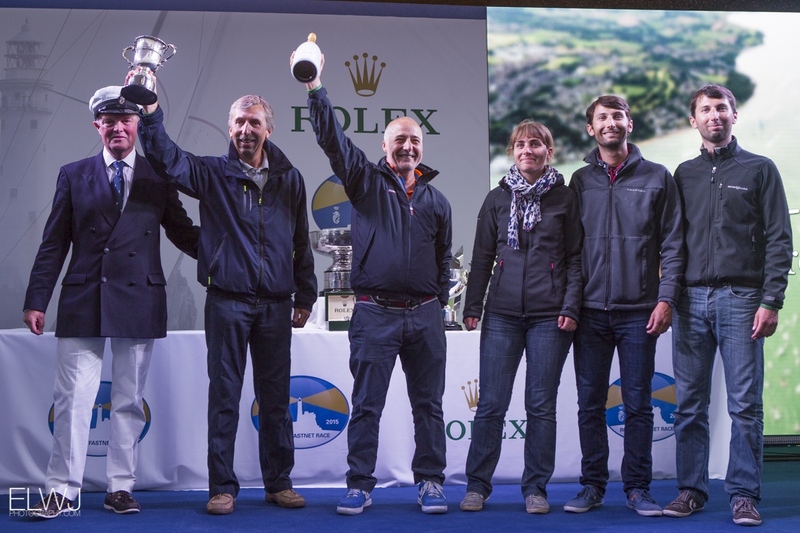 Géry Trentesaux and his JPK 10.80 Courrier Du Leon have been confirmed by the Royal Ocean Racing Club as winner of the 2015 Rolex Fastnet Race. For this the team will receive the Fastnet Challenge Trophy at tonight’s prizegiving, an event doubling as the 90th anniversary celebrations of the RORC’s flagship offshore race. In this, the Frenchman’s 13th attempt at the Rolex Fastnet Race since his first in 1977, Trentesaux’s performance was exceptional, beating Arnaud Delamare and Eric Mordret’s second placed JPK 10.80 sistership, Dream Pearls, by 2 hours 20 minutes. And this was despite being over early at the windless start and taking 40 minutes to restart. Courrier Du Leon was competing in IRC 3, but managed to beat all of IRC 2 on the water into Plymouth. Personally Trentesaux is an offshore racing stalwart, who led a French team to victory in the 2006 Commodores’ Cup and was part of France’s winning Admirals’ Cup team in 1991. But he is versatile – he raced singlehanded offshore in the 2006 Route du Rhum and regularly competes inshore in one designs – he currently owns a J/80 and a Diam 24 trimaran. 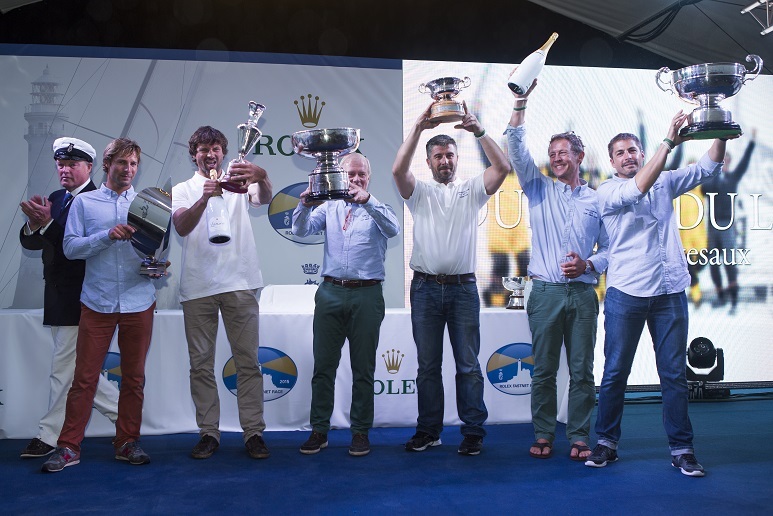 With the latest deluge of arrivals in the Rolex Fastnet Race, overall victory is currently looking like it might be claimed, in this 90th anniversary running of the Royal Ocean Racing Club’s flagship offshore race, by a fast boat in the 35-40ft range. Most promising at present is Gery Trentesaux’s new JPK 10.80, Courrier Du Leon. Overnight arrivals have caused the corrected times of Rambler 88 and Leopard to plummet down the IRC Overall leaderboard, leaving Dieter Schon’s Maxi 72, Momo, strongest among the big boats. American Ron O’Hanley’s Cookson 50, Privateer, winner of the 2013 RORC Caribbean 600, finished in Plymouth at 19:25:08 yesterday evening and looks set to be on for a top 10 position overall and is currently second in the IRC Canting Keel class behind Nicolas Groleau’s Mach 45, Bretagne Telecom. Privateer lost contact with the biggest boats in the fleet at the Scilly Isles, but was not alone in doing so. 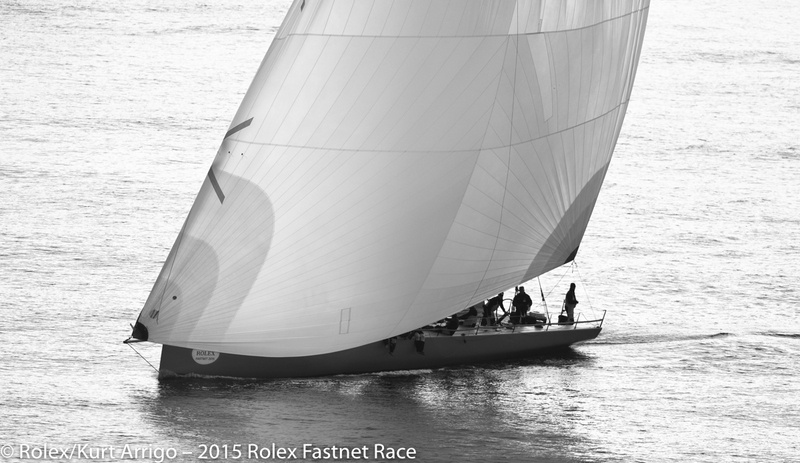 This was O’Hanley’s first Rolex Fastnet Race and he was thoroughly impressed. 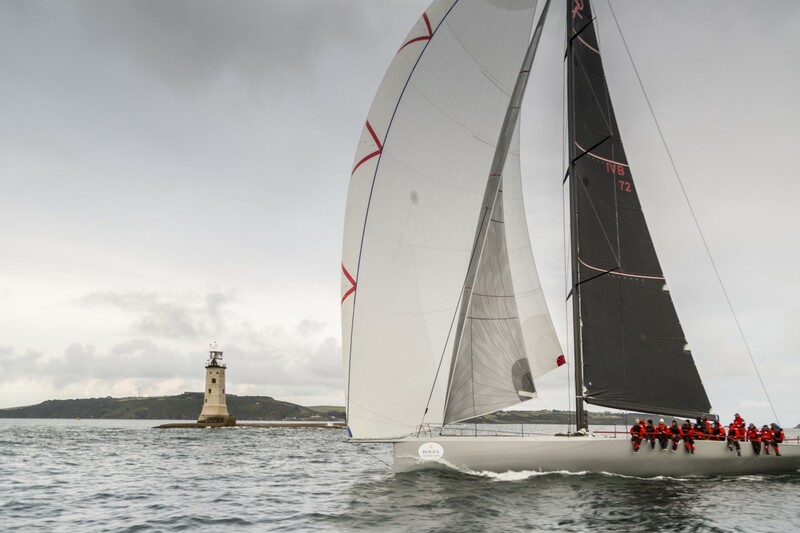 Battling for line honours in the Royal Ocean Racing Club’s Rolex Fastnet Race continued all the way to the Plymouth finish line last night in both the maxi-multihull and monohull divisions. Among the multihulls, Yann Guichard and Dona Bertarelli’s 40m Spindrift 2, found herself locked in a match race with two time Route du Rhum winner Lionel Lemonchois’ Multi 80, Prince de Bretagne, between the Traffic Separation Scheme (TSS) south of the Scilly Isles to the Lizard, before her sizeable waterline length advantage prevailed. The giant trimaran crossed the line at 22:57:41 BST in an elapsed time of 2 days 10 hours 57 minutes and 41 seconds, more than a day outside of her own record, set in the 2011 race.